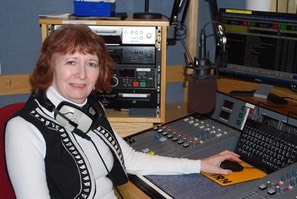 My regular show is on channel 3 “Choice” on Tuesday nights from about 8pm, where I welcome requests interspersed with a selection of music from the 30s through to the 70s with some classics from the musicals thrown in. I can often be found making a nuisance of myself at fund raising events or joining a team at the League of Friends quiz nights. I took early retirement from working in finance at the fire service in 2011 but don’t seem to have much free time especially as I have recently moved into my late mother’s property. My hobbies include researching my family tree, travelling, knitting/crochet, entering competitions and middle eastern dance. I have also done some film extra work (usually out of sight of the camera). Oh and the HRM accounts of course!